Halotron extinguishers make great replacements for older Halon extinguishers, which have been banned in Europe and Australia, as well as for all except military use in the U.S. Furthermore, Halotron fire extinguishers have been approved for use in airplane cabins by the FAA and are safe for use in confined spaces, unlike Co2 extinguishers. Also make sure to check out other great items from Buckeye. 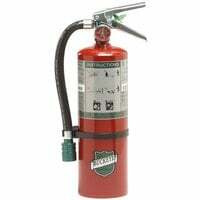 A Halotron extinguisher is a perfect choice for offices and areas that contain sensitive electrical equipment such as computers, data storage areas, cockpits, and more. Since they combat fires in much the same way as an ABC fire extinguisher without the messy leftover residue, a Halotron fire extinguisher is a cleaner, more sensible choice when protecting the contents of a space are your top priority. 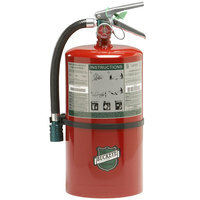 Be sure to choose the right fire extinguisher labels and signs and extinguisher cabinets and brackets for mounting and labeling your Halotron fire extinguisher. 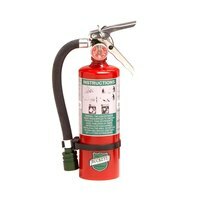 If you're wondering where to buy halotron fire extinguishers, we have a large selection of halotron fire extinguishers for sale at the lowest prices.